There is a common misunderstanding that it is only portable equipment that needs to be PAT tested. It’s easy to see how this has come about, after all PAT stands for portable appliance testing. However portable appliance testing actually refers to the process that is more formally described by the IET as ‘In-service inspection and testing of electrical equipment’. So the PAT testing process actually covers the inspection and testing of all electrical equipment and appliances that are connected, or could be connected, to the fixed electrical installation. Most equipment will probably be connected via a standard 13A plug, but this is not always the case. For example, some equipment may be permanently fixed via a fuse spur, or use an industrial plug and socket arrangement. The IET categorise electrical equipment into specific types. The distinctions between the types of electrical equipment are mainly used to determine inspection and test frequencies, but they also effect some of the tests and test limits. Portable - A portable appliance is defined as are anything that is less than 18kg that is intended to be moved, or can easily be moved, whilst in operation. So for example a kettle is a portable appliance. 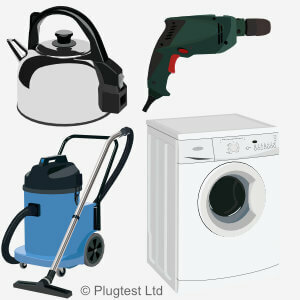 Hand held - Hand held appliances are designed to be held in the hand during normal use. For example a hair dryer. A kettle, even though it has a handle and designed to be picked up, is not classed as hand held because it is not designed to be held in the hand whilst it is heating the water. Hand held appliances are considered high risk. They are more likely to be dropped and damaged and the consequences of an electrical shock are likely to be severe. Moveable - Moveable equipment is less than 18kg and not fixed, or has wheels or castors to allow easy movement from one place to another. The distinction between portable and moveable equipment types is not always clear. For example a toaster is portable, but a microwave that is not often, or easily moved, would be classed as moveable. Moveable equipment is sometimes also referred to as transportable. Stationary - Equipment such as fridges, washing machines, vending machines etc., that are more than 18kg and not easily moved are classed as stationary. Because stationary appliances are rarely moved they are less likely to suffer damage so the frequency of testing required would normally be less than a hand held appliance for example. Fixed - This is equipment that is securely fastened in place, for example a storage heater fixed to the wall. Other equipment types can also be classed as fixed when they are permanently connected to the supply via a fuse spur. For example a kettle in a hotel room connected via a fuse spur, rather than a 13A plug. Built-in - This is equipment is often found in kitchens and is designed to be built into a cupboard, e.g. a built in cooker. The appliance usually relies on the sides of the cupboard to provide additional protection against electric shock and should therefore not be used unless installed in a suitable recess. IT - Computers, printers etc.